Do you like consuming delicious calorie-laden items while surrounded by Adriana Lima clones in the country which is tied with Japan for the highest anorexia rate? If so, read on and learn about the best places in Argentina to continue catering to your obese self. Just kidding, except not. This has been our number one restaurant so far in Buenos Aires, due to its exquisite cuisine which is exemplary in both presentation and flavor. The restaurant was able to make a special vegetarian tasting menu for me, substituting mushrooms for ceviche and cheese for confit duck, among other dishes. This may sound boring, but it definitely wasn’t. 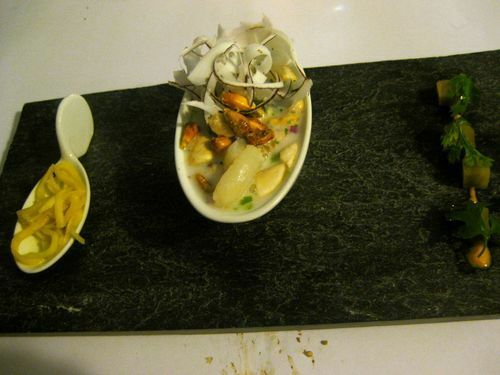 The presentation was similar to molecular gastronomy-style restaurants like Marigold Kitchen (what Gareth refers to as “fashion food”), however the food was hearty South American fare rather than frothy flavored bubbles, despite its Instagram-ready appearance. I found all of my courses satisfying but not stuffing, whereas Gareth was a little hungry afterward, so if you have a big appetite, that may be worth noting. Then again, we skipped out on the last course which may have quelled his hunger, a Colombian coffee with cardamom and cinnamon, because we had to wake up at 6:30AM and it was past midnight aka a no-caffeine zone. i-Latina is perfect for a special occasion, from an anniversary to a birthday to a fancy date night. Although it grew louder as the night went on, with the cook coming out to socialize with various parties growing more bacchanalian in their wine-induced revelry, the overall vibe was intimate and romantic. It was probably our most romantic date ever, barring our third ever date at The Stanton Social in NYC. Without a doubt, it was our best meal in Buenos Aires thus far and I would strongly recommend it to those seeking innovative yet definitively South American cuisine in a beautiful, romantic setting. Although I mentioned it before, this amazing (and amazingly cheap) restaurant in Bariloche has been one of the culinary highlights of our trip. For 1/5 of the price of i-Latina, we each received a hearty vegetarian Plato del Dia, agua con gas and freshly squeezed juice. We can’t think of a single complaint about the food, except that we are now a plane ride away from it. 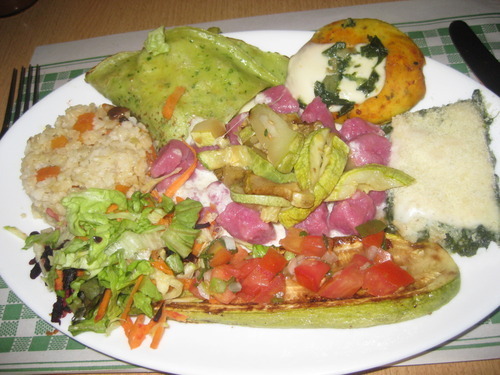 Hierba Buena is the best all-vegetarian restaurant that we have been to in Buenos Aires so far. 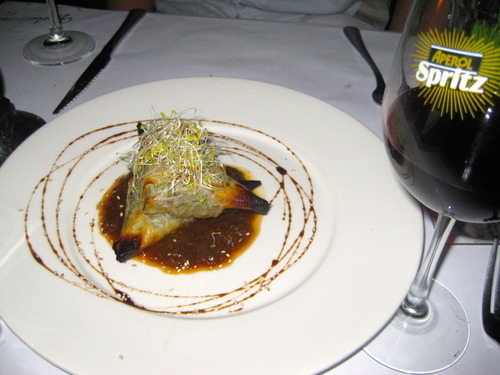 We had green samosas to start, which were delicious albeit a little too small to share, followed by our own entrees. I can’t remember exactly what I had (I think gnocchi?) but I do remember that it was delicious and very satisfying. We treated ourselves to a bottle of Trumpeter Malbec, a popular Argentine brand which was very reasonably priced and did the trick in getting us ready for a wild Sunday night of clubbing. I also had a mojito which was decent but prepared very slowly. Service in Argentina in general is very slow… At every restaurant mentioned in this blog, the meals took twice as long to come (or more) than they would in the United States. Sometimes staying awake at dinner feels like an accomplishment, especially when the meal begins at 11PM. The perfect thing to wake us up after a long night of… eating was found in Bariloche at a tacky treats shop. The jolly caricature of Tante Frida welcomed us into her humble abode through her slapdash presence on the storefront, seductively beckoning us in for an early repast of waffles con dulce de leche. We happily obliged nearly every morning that we were there. Tante Frida was hardly glamorous, in fact it was a fast food-like ambiance, serviced by hefty Chilean waitresses in acidwash jeans and Santa hats. Despite its lack of chic, Tante Frida provided the ideal morning sugar rush to get us through long days of biking, hiking and otherwise casually climbing vertiginous hills. 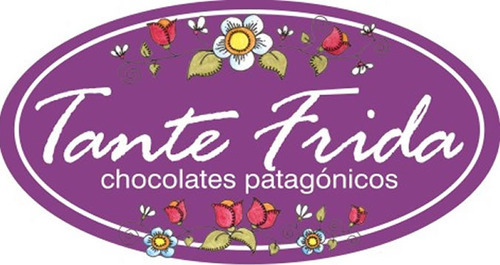 Like a significantly less expensive Argentine iteration of Max Brenner, Tante Frida provided all of the calories which one would need for an active day in one wholly satisfying saccharine-saturated dish. Ideal hangover (or post exercise-hangover) food. In contrast, Oui Oui in Buenos Aires assures a trendy AM gastronomic experience, melding the American experience of brunch with a laid-back European cafe-style vibe. We had to wait 15 minutes for a table, as it is popular with both portenos and extranjeros on the weekend. Since there were only two of us, we were able to scoop one up fairly quickly, but I would recommend making a reservation if there is a bigger group. I’m not usually not (read: never) that annoying size-0 person who orders salad at brunch, but I got one at Oui Oui after visually lusting after someone else’s greens. Any health benefit was outmasked by the mass of Brie cheese and delicious pan integral which were heaped on top of the salad, making it a filling and satisfying brunch option. 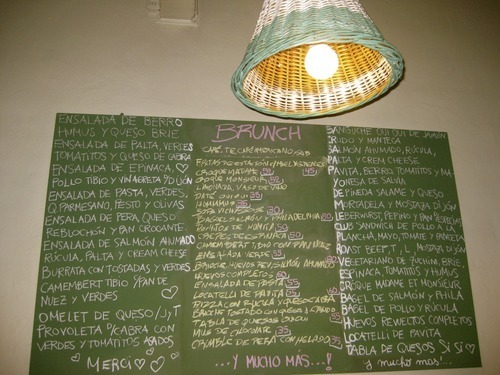 I look forward to going back next weekend when I am back in Buenos Aires, as there were a lot more brunch treats on the menu which I would like to try and I very much liked the cool, Euro-chic atmosphere. Stay tuned for part II of our gastronomic adventures, where we ponder whether or not Uruguay is also for comida-lovers or merely clubhoppers.